Steam locomotive 23 002 of the German Federal Railways. "What if?" is a frequently-asked question posed by model builders. This is not surprising because that's how new creative ideas can flourish and be developed and contribute to innovative games. So what if the German Deutsche Bundesbahn had already acquired one of the two pre-series 23 locomotives earlier ? The advantages of the locomotive would have been available to the DB as well, since they also had locomotives of the series 50. Both locomotive series had the same boiler. The locomotives would have been perfect to haul express trains, as they were particularly fast when accelerating. 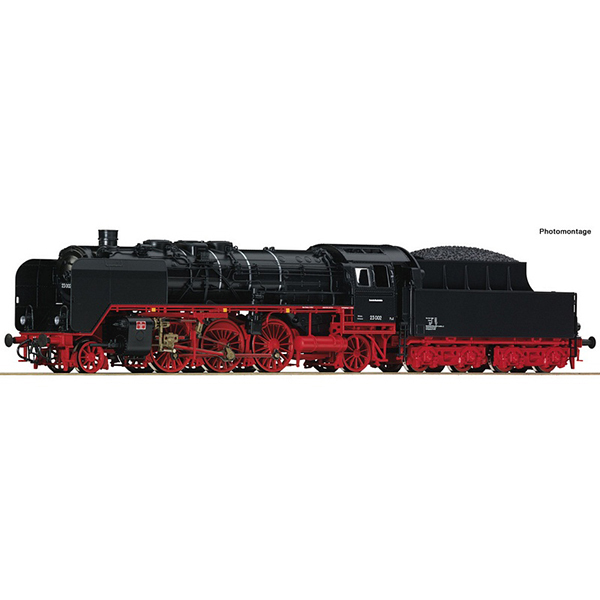 Our model series 23 002 was operating for the German Federal Railways around 1952 and was very much appreciated by the West German locomotive staff. The locomotive was not well received in the early stages, but then quickly became a star and expert in her field. No wonder that the staff of the locomotive depot didn't miss the chance to mount exquisite boiler bands on the locomotive.